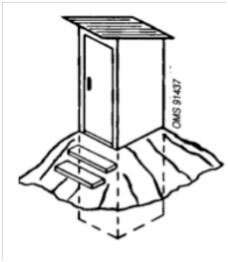 These are specific models of buried single-pit, and sometimes twin-pit toilets or slightly elevated toilets built to meet specific needs, situations or configurations in the field such as hard soils, wetlands or floodplains. Their use is thus less common. 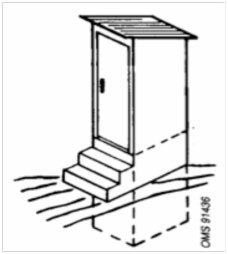 There are more especially four types : twin-pit latrines, raised pit or backfill latrines, borehole latrines and suspended latrines. 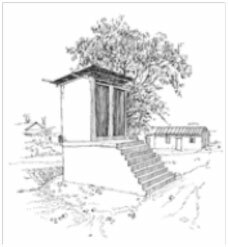 Other than their specificities described below, these latrines are quite similar to those described in fact sheet A6 on dry, simple, single-pit latrines which you are advised to refer to. Is almost the same as for single-pit latrines. It involves digging two adjoining pits or two pits close to one another. Another technique involves, to avoid having to move the superstructure, placing it not above but in front of the two pits, which makes them also more convenient to drain, and connecting it to the pit by two pipes, or more rarely a removable hose. - either when the ground is quite hard and it is less difficult to dig two side-by-side pits with a smaller capacity than a deep pit. In both cases, it is preferable to provide a lightweight superstructure that can be easily moved. Generally varying from €100 to 160 depending on the model and the region. Involves digging a pit part of which is not buried but raised by building a low elevation compartment made of concrete or plaster. For this purpose, a hole of adequate depth is dug while the ground is not too hard, but not deep enough to reach the groundwater level. This pit is then extended height-wise by building a lightweight plaster casing on its walls up to the height required to obtain the desired volume of the pit. Attention should, however, be given to difficulties of access for the elderly or disabled (in the same way as for the following variant). If the surface and quality of infiltration of the underground pit is insufficient, it is preferable to surround the upper part of the pit by infiltration backfill up to about 50 cm from the top edge, consisting of permeable, well compacted soil. This bank should be stable and thick enough to prevent any seepage on the sides. - Much easier to build on hard ground. 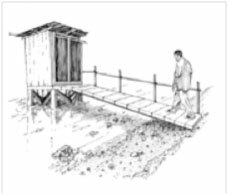 - A latrine can be built even with a high water table. - They are, however, slightly more complicated and expensive to build. 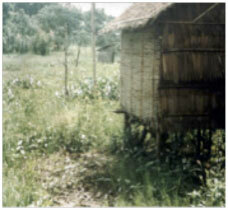 This type of latrine is mainly distinguished by the pit digging technique : by drilling and not simply by digging. Although it is not used all that much, it is sometimes in urgency situations used when adequate drilling means are available. Although major drilling facilities can be used, use can also simply be made of an auger, which is a sort of helical screw. 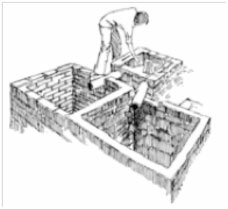 Holes are generally small in diameter (30-50 cm) and usually about 5 m deep, which may be sufficient for a family of 5 people for a period of 2 or 3 years. Although they may be up to 10 m deep, there may then be a greater risk of contamination of groundwater. Similarly, the diameter may be smaller, to make drilling easier, but there is then a risk of pit clogging and shorter service life. Even if there is no obstruction, walls are dirty near the top and hence make for a risk of fly infestation. That is why these latrines should be restricted to urgency situations for as short a period as possible. It is recommended to line the holes at least over the first 50 cm with an impervious material (concrete or fired clay). - But risk of obstruction, fly infestation and fairly short service life. These are in particular better suited to wetlands or floodplains. 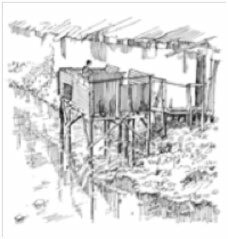 These are latrines, the floor of which is located above wetlands or floodplains, or the level of a river, which may nevertheless, through lack of precautions, pose public health and safety problems. They should only be used if no other means are available and if no other type of latrine is available in the region during critical periods. - or to fall directly into the water, although this method is not recommended due to the risk of contamination of the water and populations downstream. 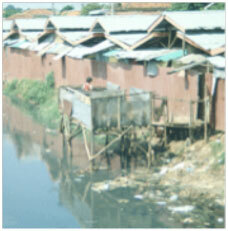 - But difficult to build, risks of contamination from leaking pits and lightweight structures posing safety problems.